Guys, I had a revelation about popcorn this week. It was twofold. The first fold was that microwave popcorn does not taste that good. The second fold was that most of the popcorn I buy is probably genetically modified. I know, horrifying! I don’t want to eat that crap! I also remembered my parents making popcorn in a pot when I was a kid, so I decided to give it a whirl. What a fantastic experiment! 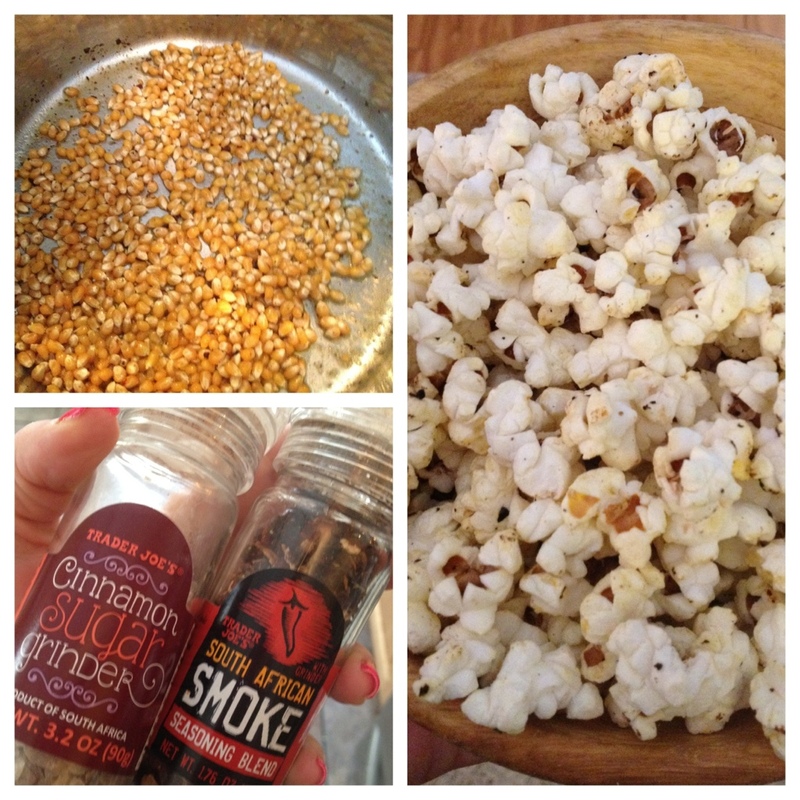 I’ve been making plain buttered/salted (Earth Balance buttered, that is) and this deliciously savory sweet and spicy mix. This one is like the popcorn version of fancy warm bar nuts. In bottom of pot, toss organic popcorn kernels (enough to cover pot), a dab of Earth Balance (or a little olive oil), a generous pinch of sea salt, and a generous grind of African Smoke Seasoning from Trader Joe’s (this stuff tastes like the powder on barbecue chips). When I say “generous” I mean generous. Whatever salt and seasoning you put in the pot right now is what is going to season all the popcorn. Once the popping has slowed down to a pop every few seconds, remove from heat. Now, stir in a little melted Earth Balance (this is vegan butter, btdubs. Feel free to use dairy butter if that’s your thing) and a generous grind of Trader Joe’s Cinnamon Sugar. Stir it up and enjoy! PS, Just a friendly word of advice: wait until the pot is cool to attempt washing it. I learned that lesson the hard way via a wicked painful steam burn on my thumb.